I discovered the affordable yet delicious Fat Barrel wines from South Africa quite by accident at my local Bottle King. Earlier this year they had the Fat Barrel Cabernet/Shiraz blend on sale as one of their wines of the month, and then more recently the Fat Barrel Sauvignon Blanc. I have to say that both were excellent for under $10 a bottle. The Fat Barrel Wine Company was founded by Portland, Oregon entrepreneur Bob Lynde, who had spent 13 years in the wine business in Oregon. He was enthralled by the 350 year old winemaking tradition in South Africa after a trip there in 1994, and so he founded the Fat Barrel Wine Company to import wine from growers in South Africa, donating a percentage of the profits to humanitarian causes. Fat Barrel also produces wines from Oregon growers, but I have yet to sample any of those. I’ll be sure to write about it when I do. For the price, I thought this was an excellent wine. Some red fruit / black current jamminess but not as berry-filled as a Merlot. The cab/shiraz blend works well, with the background of black pepper from the Shiraz, and a hint of vanilla. This blend is 75% Cabernet Sauvignon (two different varietals), and 25% Shiraz, grown in the Wellington / Groenberg area of South Africa. It is a tasty, soft, yet structured wine. The vineyards are in Paarl, in the center of South Africa’s wine country. The shelf description from the Bottle King “Wine Buyer” reads: “This very smooth, medium-bodied red blend from South Africa starts with loads of jammy black current and cherry flavors which are complemented nicely with nuances of black pepper, tobacco, cedar and vanilla. Hard to find a better value at this price point!” They gave it 91 points. I’ll have to pick up a couple more bottles and see how they are after a year or two, since this bottle was still quite young. 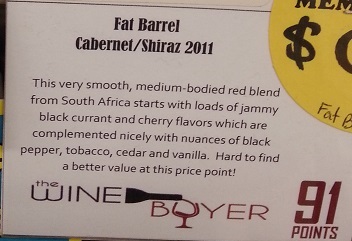 After my positive experience with the Fat Barrel Cab blend, I was happy to see the Fat Barrel Sauvignon Blanc as one of the Bottle King’s May wine picks, also priced at an affordable $9.95 (on sale with club card). According to the Bottle King’s Wine Buyer, this wine is “vibrant with flavors of lime, grapefruit and gooseberry. Nice minerality and a very refreshing finish.” They gave it a strong 90 points. We enjoyed it with a simple dinner outside of grilled chicken, sweet corn and garlic/parmesan pasta. It was refreshing and light, with the grapefruit flavors typical of Sauvignon Blanc. Another excellent bargain buy. I will have to buy a few more bottles for the summer.